During the second round of Cat Zingano’s Muay Thai debut last night (June 25th), she took several knees to the body and a kick to the head. After going back to her corner, the # 1 ranked female MMA fighter at 125-pounds was admittedly out of her comfort zone. With her husband Mauricio and son Brayden looking on, Zingano came out in the third round legs ablazing, with an aggression that proved to overwhelm her veteran opponent, Fahpikart. But she still had to setup the knee strikes and used her strength to clinch Fahpikart, who has had over 35 fights, softening the Thai native first with elbows to the head. Then the knees started and it was all over just seconds later. It took about six devastating knee shots to Fahpikart’s sternum to knock her down, each one wearing her out. Zingano, whose professional MMA record is currently stands at 6-0, started the fight with several harsh elbows, eventually dropping her opponent twice in the second round with leg sweeps. 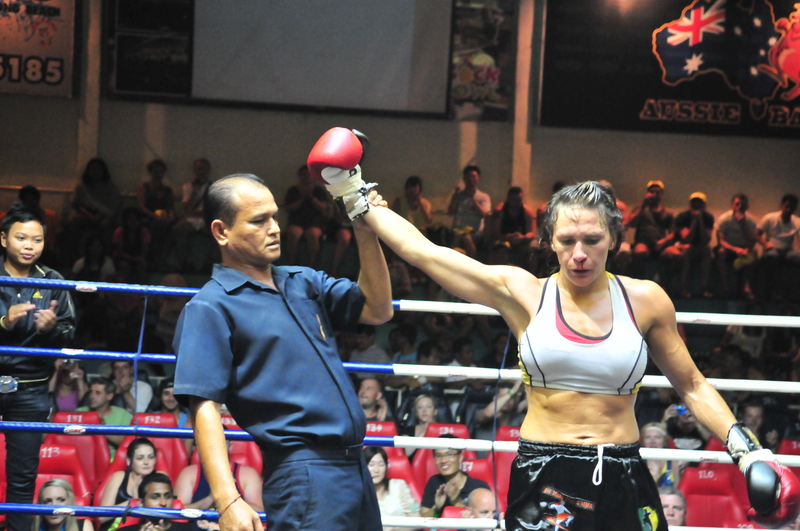 The rush of winning her first Muay Thai fight quickly became somewhat of a drug for her. Though it was an impressive win for someone making their debut, Zingano is still not satisfied and craves more.